Some sad 2-Tone related news. The legendary Coventry ska DJ Steve ’Cardboard’ Eaton has passed away after a long illness. Eaton was best known as the rude boy on the cover of the The Selecter's first album 'Too Much Pressure' and the image of him hiding his head in his arms with his pork pie hat on the ground near him became as popular a symbol of 2-Tone as the well known Walt Jabsco logo. 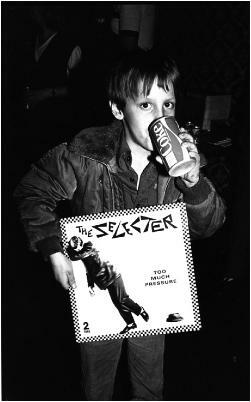 The Selecter's first album cover was part of the overall design aesthetic developed by Jerry Dammers along with David Storey and John 'Teflon' Sims who worked in the art department at Chrysalis Records. According to Storey, "The Too Much Pressure sleeve was based on a picture we found in a vintage advertising book that John Sims owned. The album cover collage, featuring the crestfallen man, probably looks like it was done in 2 minutes, in reality took several days of minute adjustments and tweaks until Jerry was 100% happy. As usual when the proof came back from the printers we could all see that the extra effort had paid off." Below is an article from the March 22, 1980 edition of Sounds which provides a behind-the-scenes look into all that went into creating the album cover. Thanks to HPSKA for the article. Eaton was a Coventry music scene mover and shaker and one of the original DJ's at the popular Hand & Heart venue in the city which played host to the emerging Coventry punk scene in the late 70's. The club also played an important role in launching many of the early embryonic versions of early 2-Tone bands. According to Coventry music historian Pete Chambers, reggae band Hardtop 22 played at the club and a few months later key members of the band would form the core of The Selecter. On February 23, 1978, a band called the Coventry Automatics played the venue and on Friday December 1, 1978, they returned as The Specials. 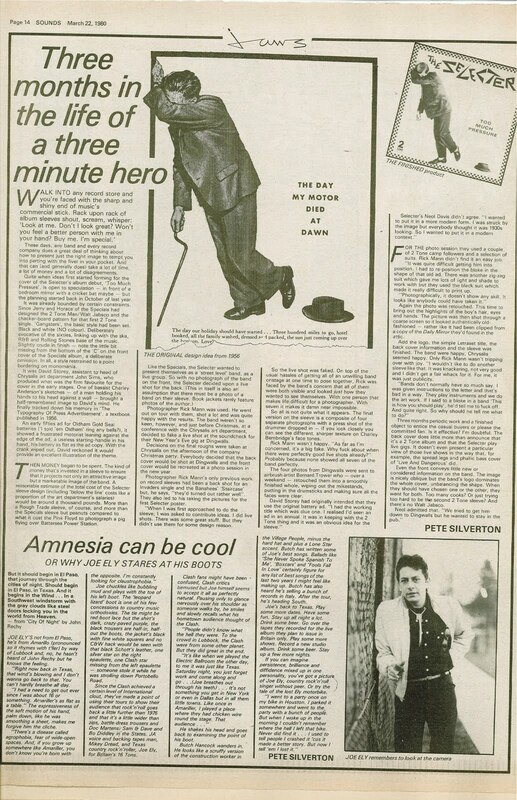 Pauline Black of The Selecter was in contact with Eaton shortly before he died. She said, "I am so sorry to hear of Steve's passing. This is a very sad moment indeed. Only four days ago, on Tuesday evening we were discussing The Selecter on a Facebook thread. His last words to me were that "he'd like to bang mine and Neol's heads together". A fighter to the last!" Black dedicated The Selecter song 'They Make Me Mad' to Eaton during a show last night in Brighton, U.K. According to Paul 'Willo' Williams the author of 'You're Wondering Now - The Specials From Conception To Reunion' and a 2-Tone expert, the image of Eaton on The Selecter's album cover is a universal symbol for 2-Tone, "Steve will always be remembered simply for his iconic pose on the front cover of The Selelcter's Too Much pressure album. That image has been as much used around the world as Walt Jabsco himself. He was without a doubt , the worlds best dressed man who had plenty of time for everybody. He will be missed by many." Wow, he'll be sorely missed. 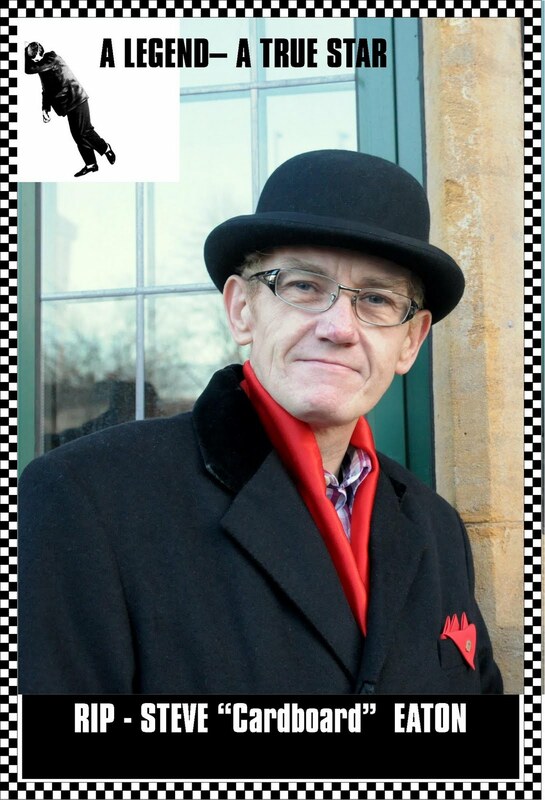 Indeed, his image on the Selecter album is the runner-up in my mind's eye as the personification of 2-Tone, next to the iconic Walt Jabsco logo. I can't believe it.